The Arthritis Consumer Experts (ACE) team views its members, subscribers and on-line or digital visitors as valued “customers”. We strive to provide our customers the latest, most relevant information and education on all aspects of arthritis, and to improve how we do that each year. Your feedback is at the centre of our pursuit to do more and better for you, our arthritis customer. To obtain your feedback each year, ACE conducts a JointHealth™ Program Satisfaction and Interest survey. By collecting your views in a standardized, fair way, we can improve our programs, activities and communications tools in a democratic way, while never losing sight of the most vulnerable in our arthritis community. The information we gather measures our relationships with people who live with arthritis and spotlights areas of information where we need to focus more attention. Do you have arthritis? If so, what type(s)? Most of you who completed the survey were between the ages of 54-74. Eighty percent of the people who filled out the survey were women living with arthritis, which reflects research that shows that, with the exception of a few disease types (gout, vasculitis, and ankylosing spondylitis, for example), women more commonly have arthritis than men. People also turned to friends and families, online journals and scientific papers, disease specific forums and community pages for information regarding their disease. This year, ACE saw an increase in the number of people who indicated that they learned more about their disease while being an active participant in the arthritis community, either through volunteering or attending workshops and special events. How to donate to arthritis advocacy and research. To everyone across Canada who completed our survey, our “customers”, thank you! Armed with this knowledge, ACE will direct its efforts toward covering these topics in more depth. This year’s survey included a section for rheumatologists and allied healthcare providers who specialize in treating people living with arthritis. ACE intends to use this feedback to innovate and develop ways to meaningfully engage with and provide resources to patients at the doctor’s office. Rheumatologists consistently recommended JointHealth™ publications focus or increase awareness on the following topics in future programming: nutrition, medication and exercise, osteoarthritis, and exploring alternative therapy options. About half of the healthcare professional respondents recognized the JointHealth™ Medications Guide and Report Card as a valuable and trusted resource tool for their patients. We encourage rheumatologists to post these publications in their office for patients to review while they wait for their appointment. To receive a copy of these publications, please contact info@jointhealth.org. ACE evaluated JointHealth™ programs according to three criteria: personal relevance, educational value and community building. Programs such as the JointHealth™ express (breaking news by email), JointHealth™ Medications Guide and JointHealth™ surveys were the most relevant to consumers. Other areas that scored well for education and personal interest to consumers were the JointHealth™ monthly, JointHealth™ web workshops, JointHealth™ Report Card and the JointHealth™ Medications Guide. About half of the respondents think that the JointHealth™ and Arthritis Broadcast Network websites provided trusted daily arthritis-related information and news. Respondents ranked the JointHealth™ website, JointHealth™ express, JointHealth™ web workshops, JointHealth™ Report Card, JointHealth™ survey, and the Arthritis Broadcast Network as great tools for community building. How Is Technology Used in Health Care and What Are the Ethical Issues? Could Joint Damage in Rheumatoid Arthritis Be Reversible? Physical Activity Monitors: Are They Useful For People With Rheumatoid Arthritis? ACE responds: These are recurring themes for our JointHealth™ programming. In 2015, ACE plans to broaden its coverage on arthritis prevention strategies. Consumers can expect to see information on the best defense against arthritis: a healthy lifestyle. We plan to look at the ways you eat, exercise, sleep, manage stress and interact with others, and whether you smoke or drink, as lifestyle factors that can have a tremendous influence on the health of your joints. ACE intends to focus on diseases that may arise in conjunction with or as a result of arthritis. We will be looking in detail at the eighty per cent of Canadians living with arthritis who report having additional chronic conditions, versus just 37% of people with a different chronic condition. According to research conducted on adults, 57% of the people with heart disease (52% with diabetes, 44% with high blood pressure and 36% who are obese) also have arthritis. ACE responds: According to a report from the Public Health Agency of Canada, aging baby boomers are at the centre of a growing epidemic. 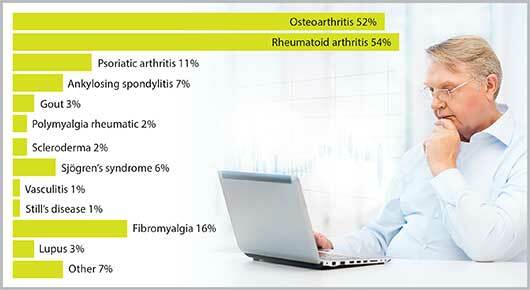 Today more than 4.6 million Canadians aged 15 years and older report that they have arthritis. With the aging population, this number is expected to increase to approximately seven million (20 per cent of Canadians) in 2031. This baby boom generation will also be the most active senior population in history. ACE plans to focus JointHealth™ editorial coverage on ways our consumers can prevent arthritis types such as osteoarthritis, which affects one out of every 10 Canadians. It strikes most commonly after the age of 45, but people of all ages – from children to senior citizens – are at risk. If caught early, as with many arthritis types, the chances of treating osteoarthritis improve greatly. ACE responds: In our upcoming JointHealth™ publications, ACE will be focusing on your arthritis healthcare team. We will be helping consumers once they have begun to build their healthcare team, with referrals to professionals like rheumatologists, physiotherapists, occupational therapists, and/or orthopedic surgeons, with the steps to take to make the most out of the time you spend with the members of your “team”. We have a free app to help you! Over the past 12 months, ACE received unrestricted grants-in-aid from: AbbVie Corporation, Amgen Canada, Arthritis Research Centre of Canada, BIOTECanada, Bristol-Myers Squibb Canada, Canadian Institutes of Health Research, the Canadian Rheumatology Research Consortium, Celgene Inc., GlaxoSmithKline, Hoffman-La Roche Canada Ltd., Janssen Inc., Pfizer Canada, Purdue Pharma L.P., St. Paul’s Hospital (Vancouver) and the University of British Columbia. ACE also receives unsolicited donations from its community members (people with arthritis) across Canada. ACE thanks these private and public organizations and individuals. ACE thanks these private and public organizations and individuals.